Brother Compatible LC10E MAGENTA Super HY Inkjet Cartridge - Oklahoma Toner Co. L.L.C. Compatible Brother LC10E Magenta Super High Yield ink cartridges compatible brand replacements for use with the following printers: MFC-J6925DW Replaces LC10EC Magenta Super High Yield Compatible Brother LC10E Magenta Super High Yield inkjet cartridge is guaranteed to meet or exceed original Brother printer cartridges in both print quality and page yield. Our inkjet cartridges have been engineered to create consistent, high quality images. 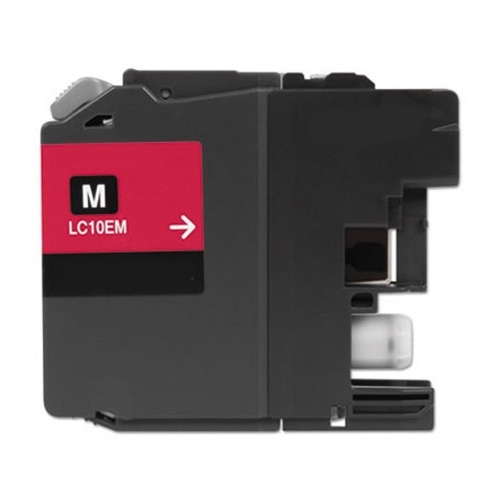 Our compatible Brother LC10E Magenta Super High Yield inkjet cartridges are made with the highest quality new and recycled components in ISO9001 / ISO14001 certified factories.